If you hadn't noticed already, I am loving September! The air smells great, I've been going for lots of lovely walks and collecting beautiful seasonal things that I can either eat or make something with! I'm so excited by it that I've started a separate seasonal Instagram account called @bloomsandbrambles, I've done this as 1- I didn't want my seasonal obsession to go mad over on what is my home style and family page, and 2- because I thought it would be a really cool place to document and share my seasonal photography with like minded people! 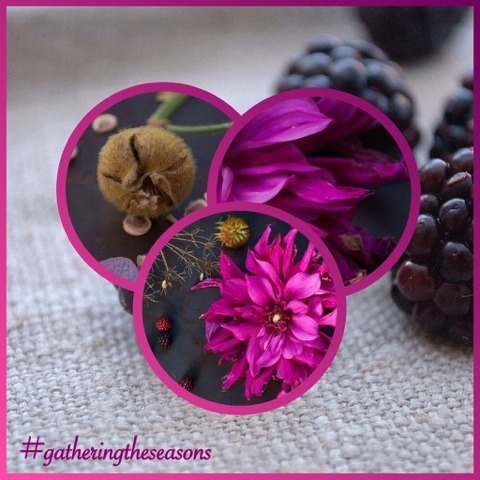 Also to encourage and inspire people to get out into the countryside and look around, I've started a new #tag called gathering the seasons. There's no specific day, anyone can join in. Just get out there, collect anything that intrigues you and create a little collage to snap, then load it to IG using the #tag and tagging blooms and brambles. Let's share our countryside!